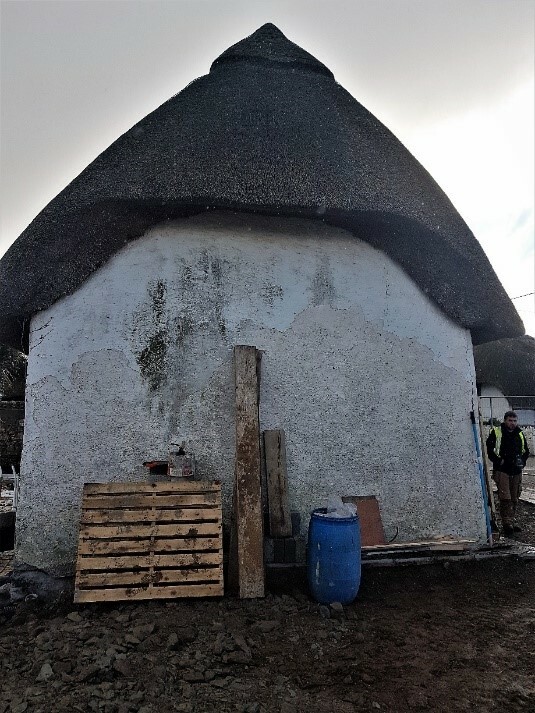 This case study of the conservation works being carried out on a thatched cottage in Kilmore Quay in Wexford demonstrates the process involved in making an old cottage work for the future. Marty and Vonnie Maher bought the cottage several years ago. They hope to move permanently into the house when renovation works are complete. 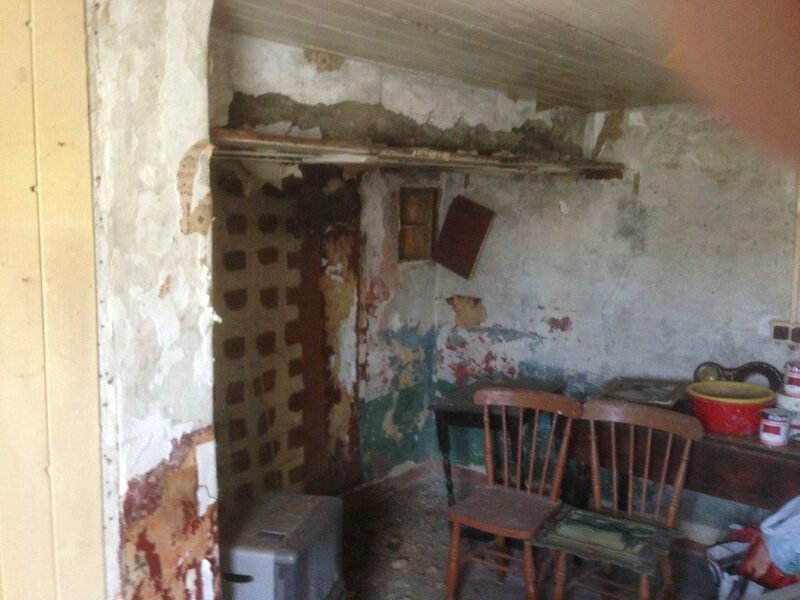 Their first job, however, is to rescue the house from a near derelict condition. 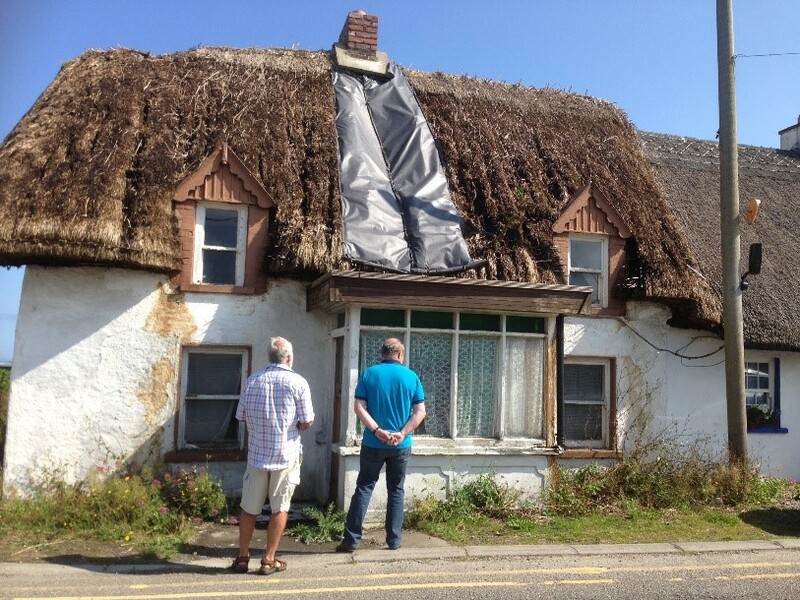 The cottage was very wet internally when the Maher’s purchased it, and their first action was to rethatch the roof, using local thatcher Mat Whelan. The cottage dried out considerably, but certain areas remained damp when they finished this work. It was at this point that the Maher’s decided to bring in professional support in taking on the building project, and Southgate Associates, a Cork based heritage conservation engineering practice, were brought in as project managers. 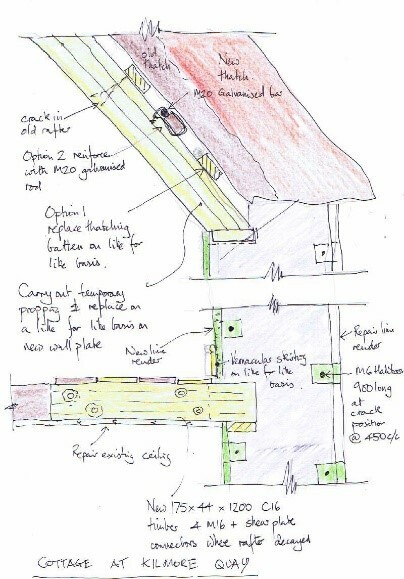 They were given the brief to project manage the conservation works to the cottage, and to advise on the design of a sympathetic extension to the heritage structure through consultation with Wexford County Council. The building works are being carried out by Martin Doyle of Michael Doyle Construction, a Wexford based construction company. The cottage is an original stone and lime cottage from the early 18th century. 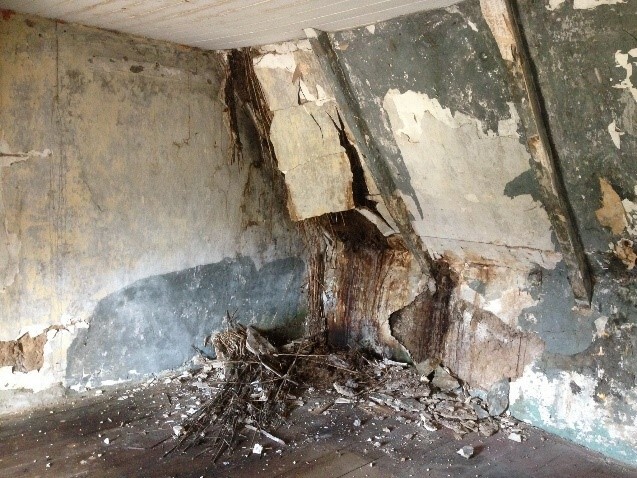 This house was altered, however, in the mid-19th century, when the walls were built up in mud (see image further down the article for the difference in texture between the rubble stone construction and those battered in mud). While the cottage was extended and ‘improved’ in the mid-19th century, very significant alterations occurred in the early 20th century, when a large porch was added to the front of the house, and a large extension to the rear. 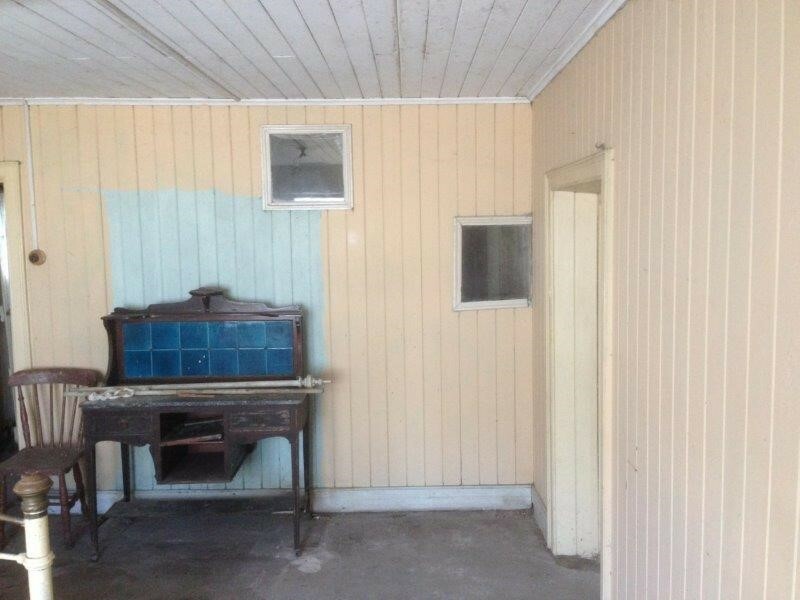 At this time the house was also decorated downstairs in tongued and grooved panelling (see photograph above). 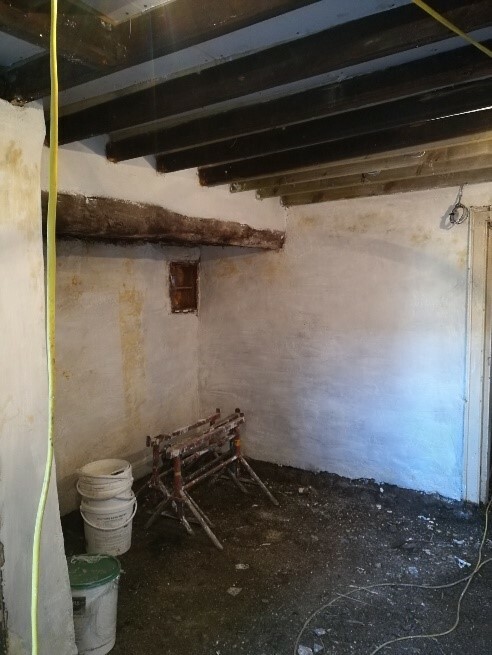 The conservation works were designed to peel back some of these 20th century interventions which were also concealing damp and to reveal the original textures of the cottage once again. This included the proposal to remove the 20th century rear extension and replace it with a sympathetic new build. An application was also made to Wexford County Council for grant aid under the Built Heritage Investment Scheme, which was successful. 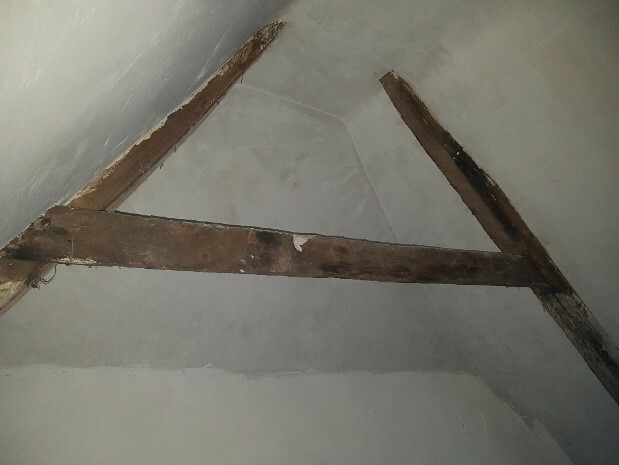 Generous financial support was provided for the conservation of the historic interior of the cottage which included stripping out inappropriate 20th century decorative treatments and cement-based renders, doing essential strengthening work to the traditional roof structure, repairing the original exposed joists and floor boards. They finished the work by using cost effective lime wash throughout the interior which left the texture of the original construction visible, while also allowing the walls to breathe. 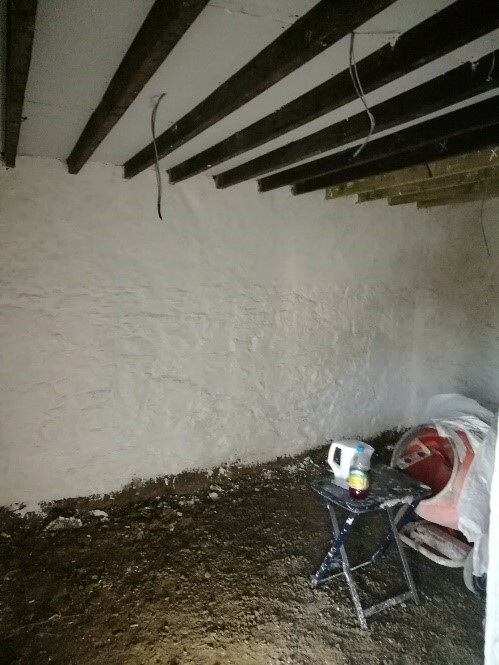 To address the high ground levels outside the cottage, which were causing rising damp inside, they artificially lowered the external ground levels by building a small retaining wall, to allow the cottage walls to dry out from the outside. In addition, the damp floors were replaced to allow for the installation of an air to water heating system. This would operate with underfloor heating on the ground floor, which ensured that no radiators would be visible in the key downstairs rooms of the cottage. This technology also works well in an historic structure, as it provides a constant low-level heat, a method which works much better for this type of structure than heating that comes on for a few hours a day. In addition, to reduce the risk of fire, electrical cabling adjacent to the thatched roof has been avoided.